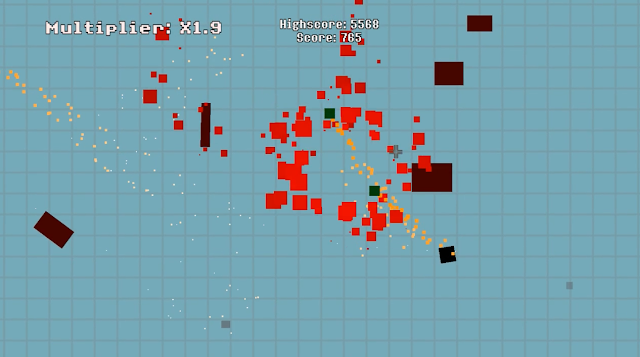 Super Displacement is a hectic, arcade shooter where the player must shoot an onslaught of aggressive quadrilaterals and avoid being bounced into the walls. In the past two or three weeks spent working on this game, I've learned some valuable lessons on how to produce a suitable working project- the first project that I can confidently say I'm proud of. The key point to Super Displacement is that the scope is very small, even for a one-man project. When I started it, I intended it to be a remake of a previous project, "Don't Be Still". Of course, over time this changed to the point where I had to change the name given that the central mechanic was no longer needed for the game to be a fun experience. The reason that I removed the "don't stand still or you lose" mechanic was not exactly born of great design principles, it was actually due to the fact that moving fast made the collision detection go a bit... iffy. The easy fix(before realizing that using Godot's _fixed_process function made collision detection easier) was simply to make it so that the player only hits the wall once per gameplay, i.e they lose when they touch the wall. At this point, forcing the player to keep moving seemed tacky. It would have overloaded what is designed to be a very simple game. After adding a copious amount of particles and screenshake(both of which seem to be very effective for some easy-to-apply "game juice"), I decided that a similarly easy way to apply some extrinsic reward is by adding a high score system. As many of you may be aware, I used the GameJolt API to add a public, synchronized high score system. I think that this was a large help in terms of replayability, otherwise the game gets somewhat repetitive. As someone who has spent about 20 hours testing the game over and over again- dear god does it get repetitive, and I've only been working on it for a couple of weeks. In a similar vein to Super Hexagon(though the comparison seems egotistical), Super Displacement encourages the player to keep retrying to beat either their own high score, or to earn a place on the leaderboard. I believe that this could be aided had I made it easier to lose more quickly, as currently individual matches can last several minutes. Also, graphically the game wasn't particularly impressive. However, I believe that it looked just acceptable enough for the graphics to not bottleneck the overall experience. This was a large part of why I feel this game was - if nothing else - a personal success. I've successfully achieved a semi-minimalistic art style without it looking too rubbish. Having said that, the background started a placeholder and (sadly) evolved into a defining piece of the game's identity. Either way, I hope that you can take some lessons from what I've succeeded and failed at doing in Super Displacement. Since I'm unlikely to continue to update this project, get hyped for my new one- and if you have done, thanks for reading!